Mandolin virtuoso Avi Avital doesn't disappoint in this diverse and interesting program with the Giocoso String Quartet. 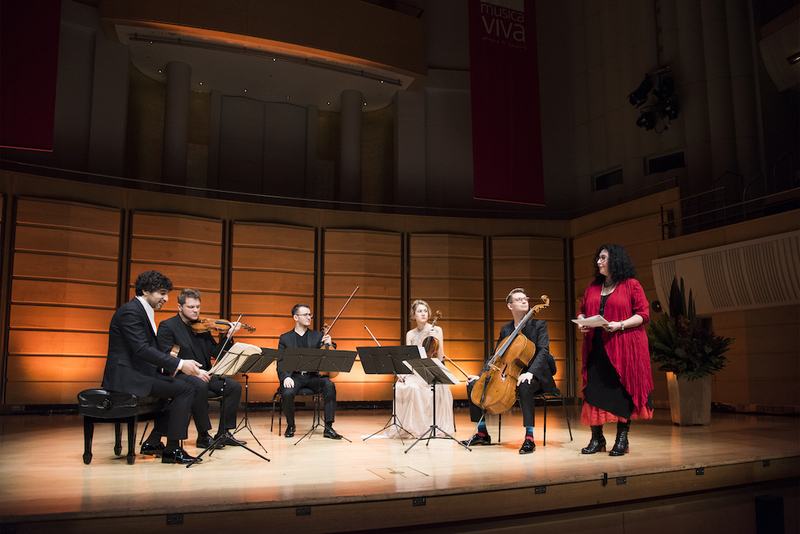 With only a few short months to go before the Eighth Melbourne International Chamber Music Festival begins, some of the stars of the Seventh are touring the country for Musica Viva. The Vienna-based Giocoso String Quartet – which has existed in its current form since 2014 – emerged from the 2015 competition as winners of the overall Second Prize, The Peter Druce Audience Prize as well as the Musica Viva Australia Prize, for which the winners are granted a national tour. 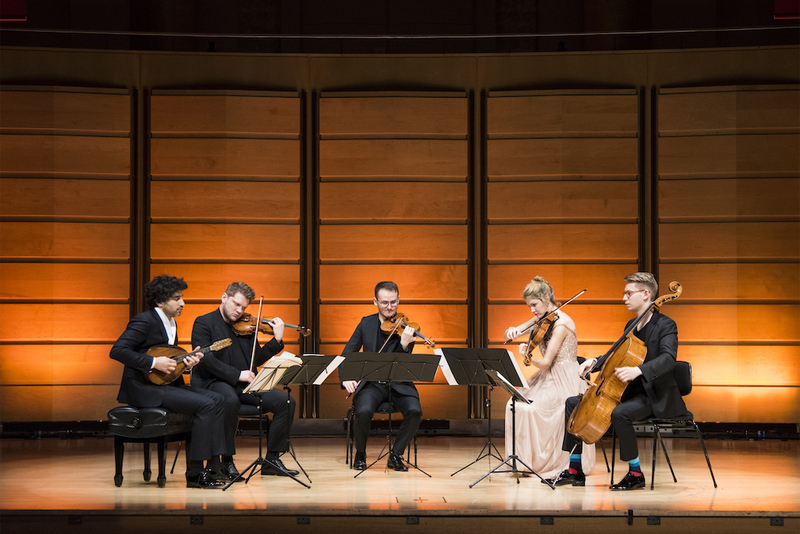 Opening the concert with Schumann’s String Quartet Opus 41 No 1 (the first of the composer’s 1842 trio of quartets, dedicated to Felix Mendelssohn), the ensemble demonstrated the finesse that made them so popular in Melbourne three years ago. The counterpoint of Schumann’s Introduzione was a beautiful way of introducing each of the four players, from Sebastian Casleanu’s luminescent violin down to Bas Jongen’s clean-limbed cello sound, the Quartet finding a gentle, well-blended tone that nonetheless hummed with life. Jongen’s cello propelled the music forward in the rhythmic Scherzo, and if there were a few moments of less than immaculate intonation in the second movement’s Intermezzo, there were also some finely fashioned swells. Violist Martha Windhagauer carved rich-hued broken chords in the third movement and there was a compelling interplay between Casleanu’s bright sound and second violinist Teofil Todica’s darker tone. The finale was a feast of surging energy and deftly navigated dynamic shifts, Jongen kicking in a folky drone from the cello. Touring with the Giocoso Quartet is mandolin virtuoso Avi Avital, who is no stranger to Sydney audiences, having brought his charismatic playing to concerts with the Australian Brandenburg Orchestra in 2014 and 2016. Avital joined the Quartet on stage for Elena Kats-Chernin’s brand new work Orfeo, a piece with its roots in the composer’s collaboration with Komische Oper director Barrie Kosky that saw her orchestrate all three of Monteverdi’s operas for a marathon in Berlin. The work, like her Spirit and the Maiden, is programmatic, though in this case it also draws on Monteverdi’s music, most strikingly at the beginning of the fourth movement. From Rose of Heaven, which saw Avital as Orfeo entertaining friends with his glittering sound in a vibrantly alternating six-eight and three-four feel, through the hazy tremolos and sickly sliding of Sea of Weaping and dreamlike dance of The Eyes of Argus – the second and third movements channelling Orfeo’s grief at the death of Eurydice – this was vividly painted musical storytelling with plenty of wonderful musical effects. There were brilliant, textural moments between Avital’s mandolin and Windhagauer’s viola, while at other times Avital’s instrument shrieked, emitting spiky grief-screams over turgid low strings. Harmonics from the mandolin evoked the sound of a music box in a quieter moment. There were times when the Quartet felt less sure-footed in the material than Avital, who was fiercely pushing his instrument to the limit against the thicker textures, but the momentum of the finale was undeniable, with Kats-Chernin’s wry humour peeking through the tragedy of the story, as “a chorus of wild women” descends on Orfeo and tears him apart. The crunching energy of final bars brought a lively “hey!” from at least one member of the audience. Avital drew the audience in to the more intimate music of Bach’s Chaconne from Partita No 2 in D Minor (BWV1004) after the interval. On mandolin the music was crisp and articulate, Avital finding an organic momentum in the sequences and neatly tracing individual lines between the instrument’s honeyed lower register and its penetrating upper notes. Tremolo, this time underscored by dark, low strings. Avital and the Giocoso String Quartet brought the concert to a close with a Russian folk song arranged for them by Kats-Chernin. This was a diverse and interesting concert of chamber music, performed with passion and energy – Avi Avital doesn’t disappoint and the still young Giocoso String Quartet have proved themselves one to watch.